Ballantine Books, New York, 2014. 164 pages. I’ve gotten hooked on Anne Perry’s Christmas mysteries. They offer a wide variety of situations, and I like some better than others. But all take place at Christmastime, and all offer a quick cozy holiday read – with murder. But justice is always done and they all have an overall message of peace and hope. My hold on this year’s novella came in just in time for Christmas, though I was already in the middle of another eagerly awaited novel, so I got A New York Christmas read a few days after Christmas. 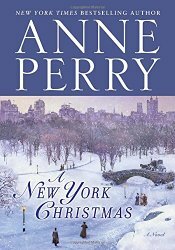 I particularly like it when Anne Perry uses characters from her other books in the Christmas novels. I don’t know why, since I haven’t read many of her other books (some day), but it gives a sense of a window into a larger world. A New York Christmas is told from the perspective of Jemima Pitt, twenty-three-year-old daughter of Thomas and Charlotte Pitt. The book opens with her on an ocean liner crossing the Atlantic. Not long after arriving, a murder happens, and Jemima is the primary suspect. The wealthy family she’s been staying with seems extra eager to place the blame on her. Can she use what she’s learned from her father to find out who is the actual killer? And where can she find help in New York City? And why did Miss Cardew’s mother abandon her child so many years ago? If Jemima can find out about the murdered woman, she thinks she might be able to figure out who did kill her. It’s after Christmas now, but this story makes cozy reading at any time. This is now Anne Perry’s twelfth Christmas mystery, and it’s never too late to start a holiday tradition. This entry was posted on Sunday, January 25th, 2015 at 9:46 pm and is filed under Christmas, Fiction Review, Historical, Mystery. You can follow any responses to this entry through the RSS 2.0 feed. You can leave a response, or trackback from your own site.